If you are someone who frequently communicates with friends across several different platforms, including MySpace, AOL, and Facebook, you are probably tired of logging in an out to find if there are messages or friends online. 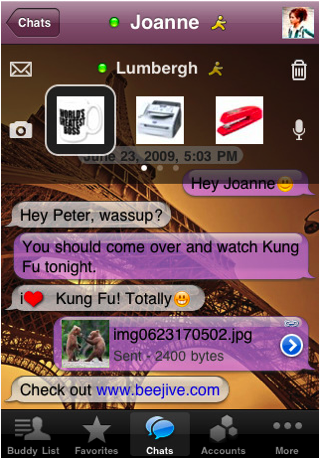 The BeejiveIM with Push app makes it incredibly easy to stay connected with everyone – even when the app is closed. 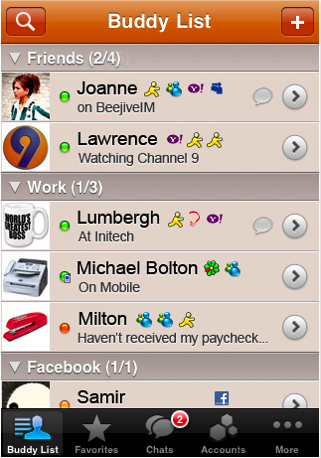 Thanks to the technologies behind Push notifications, users of the BeejiveIM with Push will be able to remain connected to all of their instant messaging friends and contacts even when the app is no longer open. When you get a message, the app triggers a Push notification on the phone, and it will even retain all of the details of an exchange should one of the users leave an area of service or coverage. Not only will the app link all of your major instant messaging accounts, but it also does so without requiring any additional services. 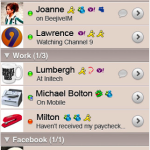 Currently it will function with AIM/iChat, MSN, Yahoo!, GoogleTalk, Facebook IM, ICQ, Jabber and MySpace IM also. Users can send files, pictures and even voice notes through the app as well. Buddy lists can be managed through the app and all settings are fully customizable. There many different social networking clients, but the BeejiveIM with Push is one that focuses directly on the instant messaging element of the most popular sites and consolidates them into a single efficient location. This app will function with Blackberry, iPod Touch and iPhone devices and works with English, French, German, Italian, Japanese, Russian and Spanish languages. The cost for the app is $5.99 and all updates are available for free. 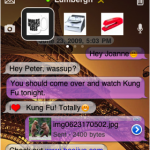 If you want to streamline your instant messaging activities, without any per message fees, this is the app to try today.